I, like many Americans turned into the 2013 Presidential Inauguration. I must say that I was quite pleased with how it turned out. It was truly a historical day within this historical year. This year marks both the 150th anniversary of the signing of the Emancipation of Proclamation and the 50th anniversary of Martin Luther’s King Jr.’s “I have a dream…” speech. The President and the first family looked quite dapper I absolutely loved Michelle’s new hairstyle, and I thought her dress fully embodied who she believes herself to be. President Barack Obama had a beautiful glow to go along with his well-fitted suit. Vice President Joe Biden also looked to be glowing, and extremely happy to be there. His wife also looked wonderful. As the cameras scanned the crowd, I couldn’t help to feel joyed by what I witnessed. There were so many different types of people. One thing that I do believe is that the President is able to reach people from different backgrounds on a much broader level. Something that I don’t think Gov. Romney could have ever done. That is the kind of president the United States needs to have continuously, and I think this in part is why President Obama was elected in 2008, and again in 2012. The Inauguration program was wonderful. The invocation was excellent, and the Brooklyn Tabernacle Choir was amazing! I was pleased when Republican Sen. Lamar Alexander referenced Alex Haley, the author of Roots, by quoting the six words Haley lived by, “Find the Good and Praise It.” The President’s speech was great. I liked how he referenced our (American) history, while sharing his platform and what he plans to continue to do as our President. I can also appreciate that he spoke about how things need to change, but not without taking steps and people making a contribution to those changes. He also repeated “We the People”, and I think that was definitely noteworthy In other words, I thought it was a great speech. Kelly Clarkson did an outstanding job, and Beyonce did a wonderful job, too. I actually had to listen to the poem twice. The first time I was a little lost, but after the second hearing, I can say that it was a well-written poem. It was very touching, and relatable. The benediction was great! I absolutely loved the fact that he prayed over ALL his children, and not just certain groups of people. 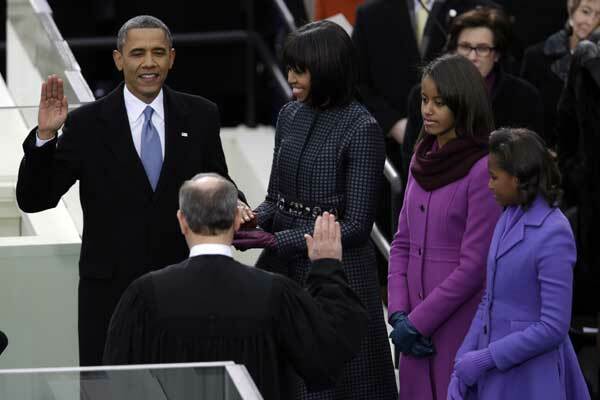 Overall, I’m happy that I had the opportunity watch the 2013 Presidential Inauguration. In the future, I’d recommend to those who haven’t watched one to do so. It’s a very important tradition in our country, and should be experienced whether in person or not. Posted on Tue.Jan.22.2013, in News & Opinion and tagged 150th Anniversary of the signing of the Emancipation of Proclamation, 2013 Inauguration, 2013 Presidential Inauguration, 44th President, 50th Anniversary of Martin Luther King Jr.'s I Have a Dream Speech, 57th Inauguration, all creeds, all people, American, Barack Obama, Barry, Barry Obama, benediction, Beyonce, black, brooklyn tabernacle choir, children, Chinese, Contribute, current-events, Democracy, Democrats, economy, emancipation of proclamation, First Family, First Lady Obama, FLOTUS, gay, glow, glowing, God, great inauguration, great speech, Growing economy, Health Care, Health Reform, Healthcare, Hispanic, Inauguration, inauguration program, invocation, Kelly Clarkson, lamar alexander, lesbian, Malia, Martin Luther King Jr., meangingful, men, Michelle Obama, Michelle Obama's hair and dress, Michelle's hair, MLK Day 2013, More jobs, Obamacare, platform, poem, politicians, politics, POTUS, Prayers, President, President Barack Obama, President Obama, presidential, presidential inauguration, Presidents, quotes, Republican, Republican Senator Lamar Alexander, Sasha, Sen. Lamar Alexander, serve the united states, Spanish, speech, straight, traditions in America, tradtions, united states of america, USA, Vice President, Vice President Biden, VP Biden, Washington DC, We the People, white, women. Bookmark the permalink. Leave a comment.